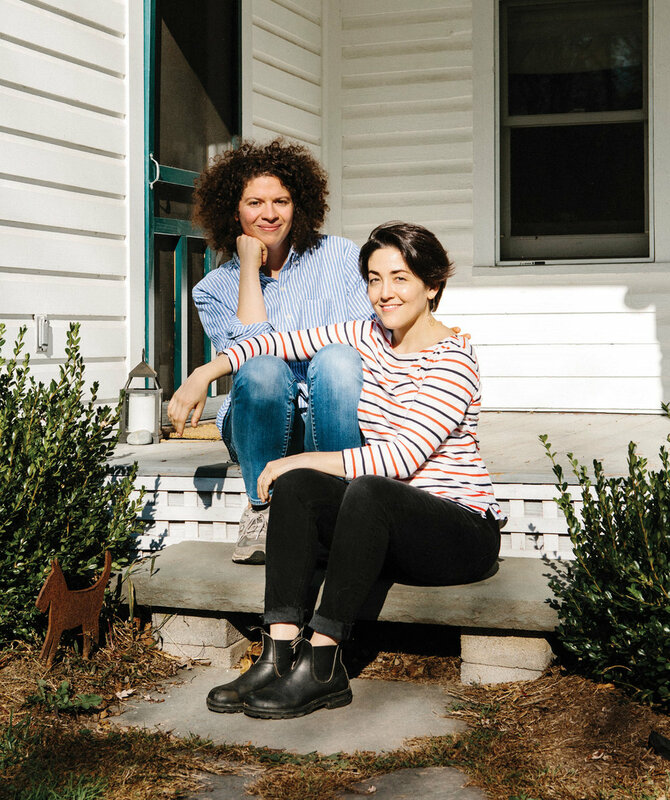 Celebrated cookbook author Julia Turshen (left) with her wife, Design*Sponge founder Grace Bonney at their home in NY's Hudson Valley. Food and interior design are often thought of as escapist mediums, as respites from the noise of our chaotic political climate. Grace Bonney, founder of the influential design blog Design*Sponge, and Julia Turshen, her wife and the celebrated cookbook author, occupy different areas of these “apolitical” spheres, what’s often called “lifestyle content.” And they’ve both had to push back against the reductive assumption that politics aren’t a part of their work. This push-back has inspired them to make social justice a focal point in their work and to be intentional about the diversity of representation on their platforms—shifting their focus to the people who create them. In doing so,they’ve succeeded in challenging their mediums’ conventions. “So often,” says Grace of her work, “people want you to essentially stay in your lane and not talk about things that are outside of your niche. But to think that people only care about food or only care about design is an oversimplification of people.” She wants her platform to be a place to foster deeper connections with not just design, but the world at large. In 2013, after running the site for nine years, she came out to her readers in a blog post and received an overwhelmingly supportive response. As part of that process, she began looking for fellow queer people in the lifestyle space. She realized then how little visibility there was for queer female creatives in particular, and she took it upon herself to find and elevate those people. In doing so, she initially fell into a trap of “listening to my own bubble,” she recalls. “I kept saying to myself, ‘I don’t know how to find these people.’ But when I stopped talking and started listening and watching, there was this incredible, vibrant community of people who, whether they’re queer or trans or POC or have different abilities, they existed.” Design*Sponge thus recalibrated, moving away from product-focused writing and imagery to the personal stories of people who make and appreciate design and fine art. Julia’s much-acclaimed cookbook Small Victories was published around the same time as In the Company of Women. And almost immediately following their successes came the results of the 2016 US election—and the waves of anti-immigrant, anti-gay, and anti-black sentiment that ensued. It became clear to them that creating space on their platforms of food and design to talk about social and political concerns had never been more important. But it wasn’t enough to just foster community in “the cloud.” The work had to translate into on-the-ground action. Julia immediately got to work on a new cookbook, one that would address the political climate head-on. A collaborative collection of recipes and political calls to action, it’s aptly titled Feed the Resistance: Recipes and Ideas for Getting Involved, and it released in October of 2017. Its goal is to give readers a way to sustain themselves as they engage, and to offer hyper-localized examples of how they can serve in their communities. She wanted the food to be affordable, nourishing, easy to make, and to feed large groups of people, and for the recipes and essays to reflect the diversity of people involved in the resistance movement. All of the proceeds from the book support the American Civil Liberties Union. After having lived in New York City for so many years, being part of a small community—the rural Hudson Valley town where they now live—greatly affected their perception of civic engagement. “When you live in a place with a much smaller population, it makes a difference if you show up. It means I show up in my community in ways that I never did before,” Julia says. As one of their routines, she and Grace get up extra early on Thursday mornings to volunteer at Angel Food East, a local nonprofit that delivers meals to homebound and chronically-ill people. They stand under the fluorescent lights of a small community kitchen, frosting still-warm sheet cakes and spooning homemade food into compostable to-go containers, and as they work they laugh and exchange stories with the volunteers who run the show. Marching on the National Mall is a powerful unifier, but this, they feel, has been a tangible way to embody the change they wish to see—a weekly act of engagement and resistance. Julia's Feed the Resistance, published by Chronicle Books, donates proceeds from sales to the ACLU. With Feed the Resistance, her goal was “to work with people who are different from me, and I did exactly that.” The cookbook features over 25 chefs and writers, including cooks like Preeti Mistry, Nik Sharma, and Bryant Terry, and activists like Jordyn Lexton and Shakirah Simley. She’d never met most of the contributors before reaching out to them for this project, but she’s since formed close bonds with them through their collaboration. “The bigger we make our communities and the more diverse and intersectional we make them,” she says, “the richer our lives will be. Julia announced the launch this week of Equity at the Table (EATT), a new database, resource, and community for women and gender non-conforming food professionals, focusing primarily on POC and the LGBT community. Inspired by the aphorism that it’s better to “build a longer table, not a higher fence,” EATT is described on their website as a practical and proactive response to the blatant gender and racial discrimination that plagues the food industry. To learn more about EATT, and to join, visit equityatthetable.com. Leah Kirts is a New York–based journalist and food writer whose expertise is grounded in connections between food, gender, social justice, and veganism. You can follow her on twitter and instagram at @leahkirts and leahkirts.com.